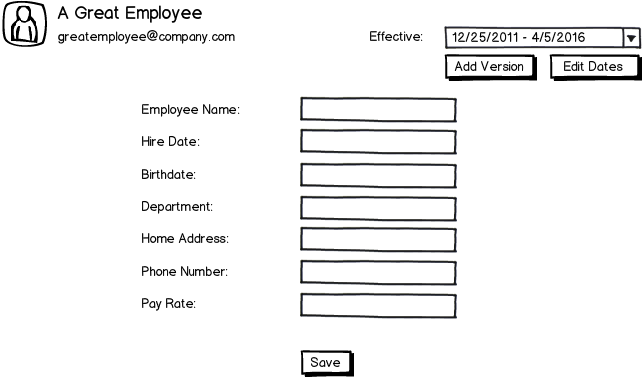 I have an enterprise-based web application that makes use of effective dates - so instead of just making a change to a piece of data, that change can take effect at some date in the future (or the past, technically). Making use of these effective dates isn't required - users might always have one record, for all time, and just keep changing it. My question is related to the dropdown where the user selects what range of dates to look at. It might not necessarily make sense to have a specific start or end date. If you've got an employee profile, until the employee quits, an end date doesn't make sense. Currently, we're picking arbitrary start and end dates that represent the far past and the far future, and using those to endcap the first and last record. Finally, my question: what would be a more effective approach to displaying the lack of specific start and end dates? For me, I think it'd be best to ask for the date of interest, then select the version based on that. I've done a lot of work on bitemporal databases and found this to be a good approach, although of course it depends on your user's expectations. Can you explicitly ask how they want to enter the dates? Then display it to reflect that? Not the answer you're looking for? Browse other questions tagged web-app controls dates enterprise or ask your own question. What is a good color indicator for showing upcoming dates?